2017/18 was another very busy and productive year for us, and you can read more about our work in markets as varied as care homes, online gambling, digital comparison tools, supermarkets and offshore engineering services in our latest Annual Report. We’ve also published our assessment of how much direct financial benefit we expect our last 3 years’ work will bring to consumers: over £3 billion and far exceeding our target to deliver £10 of direct consumer benefit for every £1 we spend. One consistent theme that stood out to me from the Annual Report is how strong partnerships form the foundation to so much of our work, and that is where I’ll begin my reflections. Listening and working well with others matters across all our work. We gather many views when we investigate mergers or when we carry out market-wide reviews. We rely on other organisations, such as business groups, to help us raise companies’ awareness of competition and consumer law. We work across government to promote the importance of competitive markets to consumers, the economy and to wider society. And we work closely with sector regulators to help promote competition in their specific sectors, which you can read more about in our latest Annual Concurrency Report. We’re also currently working with a range of people and organisations – our regular partners amongst consumer groups but also others that work closely with the vulnerable, to understand more about the factors that can affect how reliably vulnerable consumers can access markets and get a fair deal. To help strengthen our already-strong partnerships across the UK, last month we moved into our expanded office in Edinburgh, which we plan to grow to up to 30 people by the end of this financial year. We’ve established our network of Regional Champions, drawn from amongst our Directors, and they are building relationships with important partners within the English regions for which they are responsible. I’m also looking forward to November’s Board meeting in Cardiff. Leading this work is our Director for UK Nations, Sheila Scobie, who was appointed to this role in May. Our new Chairman, Andrew Tyrie, took over from David Currie last month. 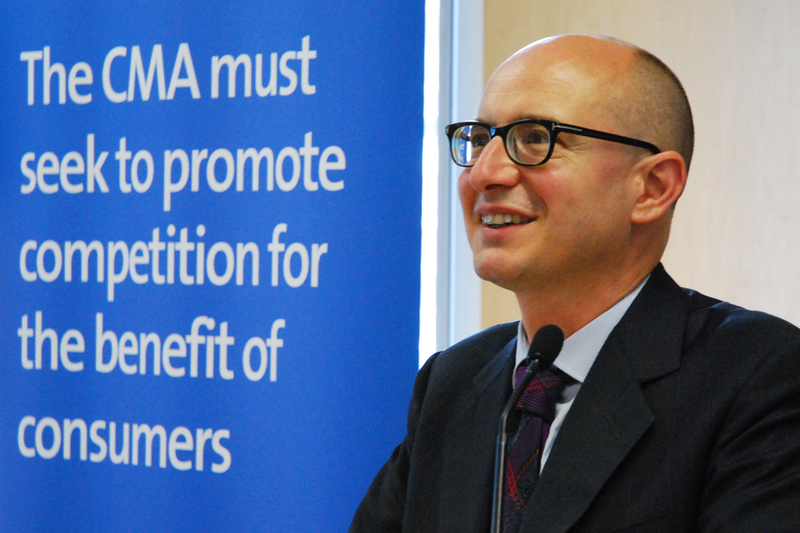 We owe David a great debt for his pivotal role in establishing the CMA as a high-performing single organisation out of the merger of its two predecessors in 2014. You can read his reflections in the Foreword to the Annual Report. Andrew’s distinguished background and strong reputation as a champion for consumers will bolster our impact as we build on our work to drive a fair deal for people across the UK. We welcomed Andrea Gomes da Silva as our Executive Director, Markets and Mergers and George Lusty as our Senior Director, Consumer Protection. We appointed Julie Bon as our Deputy Chief Economist and we’re looking forward to Stefan Hunt joining as our new Chief Data and Digital Insights Officer in August. Data is becoming ever more central to business models and to competition issues, and there is growing debate about the market power of major internet platforms due to the vast amounts of data they hold. Stefan and our new Data, Digital and Technology team will help us better understand the impact that data, machine learning and other algorithms have in markets and people. Stefan comes to us from the Financial Conduct Authority where he founded and led the Behavioural Economics and Data Science Unit. We recently published our response to the government’s Modernising Consumer Markets green paper, and we’ve been pushing ahead with a wide range of cases and projects in the first three months of 2018/19. We secured the disqualification of two directors of estate agents whose companies broke competition law. This follows an investigation that led to 5 Somerset estate agents being fined more than £370,000 for secretly agreeing between them the fees they charged. 3 major secondary ticketing websites (StubHub, Seatwave and GETMEIN!) have formally committed to give better information to customers abut tickets being resold through their platforms. So far, the fourth big player, viagogo, has failed to address our concerns and we’re currently working to secure satisfactory changes from them through the courts. Last year, as part of our consumer protection investigation following our care homes market study, one of the UK’s leading care home providers dropped its policy of charging fees after a resident has died. In May, another major provider agreed to provide more than £2 million in compensation to a large number of residents who paid substantial upfront charges that we believe likely breached consumer legislation. Online dating platform Venntro (which has over 55 million used worldwide and supplies online dating services through nearly 3,500 websites) pledged to be more upfront about how it shares personal information, following an investigation by the CMA. Most recently, we announced that we’re taking enforcement action against a number of hotel booking sites that we believe may be breaking consumer protection law. We’re demanding that sites think again about how they’re presenting information to their customers and make sure they’re complying with the law. Our next step is to take any necessary action – including through the courts if needed – to ensure people get a fair deal. We’ve launched a new market study into the £2 billion funerals market to ensure that people aren’t getting a bad deal. People can understandably be very emotionally vulnerable when planning a funeral. At this particularly challenging time, we want to make sure that the process is made as easy as possible and that prices are competitive. We published the initial findings in our heat networks market study, proposing that the sector, which we expect to expand in the coming years, should be regulated to provide better protections for customers. We published our provisional decision in the investment consultants market investigation, proposing a number of reforms after identifying a range of competition concerns. We concluded our investigation into 21st Century Fox’s acquisition of the shares in Sky it doesn’t already own. The Secretary of State for Digital, Culture, Media and Sport accepted our recommendation that the anticipated acquisition was not in the public interest due to media plurality concerns, and that the most effective and proportionate remedy is for Sky News to be divested to a suitable third party – since confirmed as Disney. We referred the proposed merger of SSE Retail and Npower for an in-depth investigation, after finding competition concerns. We began pre-notification discussions with Sainsbury’s and Asda, ahead of a likely phase 1 investigation. We’ve started to expand in readiness for the bigger role we’ll play on the world stage post-Brexit. Alongside a significantly increased merger and antitrust review role, the government has indicated its intent that the CMA takes on responsibility for enforcing State aid rules. You can read more about the new responsibilities and how we’re preparing for them in recent speeches by our General Counsel and our Executive Director, Enforcement. Things will continue to move rapidly, so to keep up to date with our work, please keep an eye on our homepage, or follow us on Twitter, LinkedIn or Facebook.